Movie theater dining goes upscale at the Arclight Cinemas' café bar. 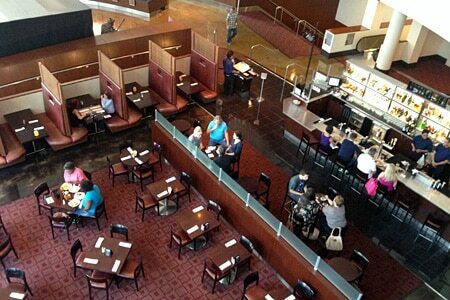 : Pre- and post-movie dining goes gourmet with the Arclight Cinemas' café. Whether looking for after-work drinks, a full meal, or just a quick bite, the theater has crafted a modern, L.A. chic atmosphere in which to unwind. 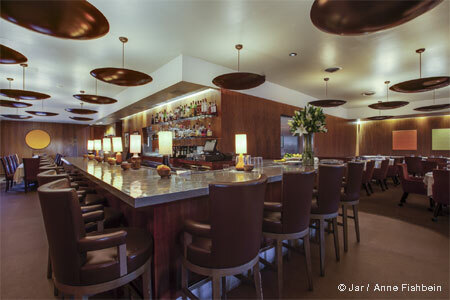 A full bar and lounge area offers a lengthy menu of inventive cocktails inspired by recent films, while the dining menu proffers California fare. One can find appetizers such as ahi tuna poke, black bean chicken chili and a citrus-marinated white fish ceviche served with fresh tortilla chips. Sandwiches like a grilled chicken club, or Southwestern burger with applewood-smoked bacon and crispy Fresno peppers, are substantial, and larger plates range from chipotle steak tacos to fish ‘n’ chips. For dessert, don't miss the crème brûlée, whose flavor changes daily. The Arclight Cinemas also boast gourmet concessions like Ghirardelli chocolate bars, sausage baguettes, and fresh-made caramel corn.